Forum > AMC's Fear The Walking Dead > General FTWD Discussion > Season 4 of Fear Has to Be the Worst Season of All Walking Dead Seasons, Right? Thread: Season 4 of Fear Has to Be the Worst Season of All Walking Dead Seasons, Right? It was a mistake to kill Madison off. And yes they did basically ignore just about everything that happened in Season 3. I hate how Daniel just kind of appears here and there. Have him on all the time or not at all. The actors who played Travis (probably my favorite character) and Nick wanted out of their own volition, so that kind of left the writers in a bit of a bind, understandably. I like Travis's sendoff but Nick's , while surprising, was not as much. I like Al and John but Morgan just seems like an odd fit in Fear. 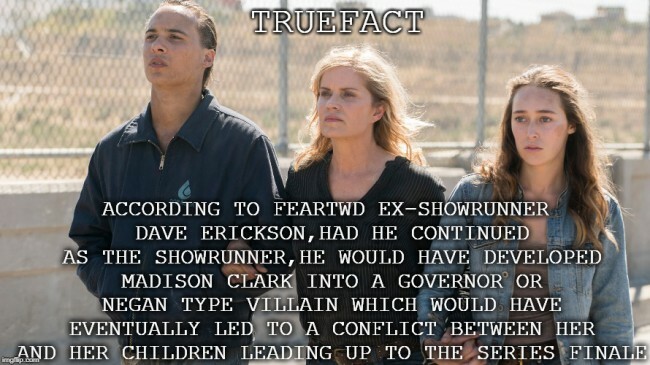 He had many connections on The Walking Dead that will likely never be explored anymore. Henry particularly, and his friendship ( I guess) with Carol was interesting. Season 2 was still a much weaker season overall but 4 changed the shape (and cast) of the show in a way I've never seen in any show I've watched. And I'm not sure I like it. Overall though Season 8 of WD was much worse than Fear season 4. Season four of Fear probably matches up with season 2 of Walking Dead in my opinion. It's decent overall, but it felt like the first season of an all new show, not a continuation of Fear. This show hit rock bottom as soon as Nick died, but then it somehow even dug itself deeper by killing Madison. We could've got this but nope.. I would have to say I'd much, much rather watch season four of Fear rather than seasons six, seven or eight of TWD. I disagree as well that there were no good episodes. I thought the first half of four was overall pretty good besides killing Nick and Madison. The second half though was a mess, and that villain has to be one of the most ridiculous villains I've ever seen. It was so absurd. I was also really, really disappointed we didn't get to see Morgan interact with Madison. That's one of the things I was most excited for, as well as Morgan & Nick. That could have been really great as well, but we got cut short on that as well.